Trigger points lead to an increase in muscle stiffness and tenderness and a decrease in range-of-motion. In addition, the discomfort from Trigger points can radiate (called referral pain.) Trigger points can cause symptoms not normally associated with muscular symptoms, such as sweating, ringing in the ears, dizziness, urinary frequency, buckling knees, and tearing of the eyes. 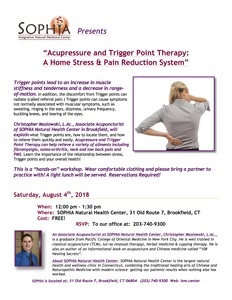 Christopher Maslowski, L.Ac., Associate Acupuncturist of SOPHIA Natural Health Center in Brookfield, will explain what Trigger points are, how to locate them, and how to relieve them quickly and easily. Acupressure and Trigger Point Therapy can help relieve a variety of ailments including fibromyalgia, osteo-arthritis, neck and low back pain and PMS. Learn the importance of the relationship between stress, Trigger points and your overall health! This is a “hands-on” workshop. Wear comfortable clothing and please bring a partner to practice with! A light lunch will be served. Reservations Required! is a graduate from Pacific College of Oriental Medicine in New York City. He is well trained in classical acupuncture (TCM), tui-na (manual therapy), herbal medicine & cupping therapy. He is also an author of an informational book on acupuncture and Chinese medicine called “108 Healing Secrets”. About SOPHIA Natural Health Center:SOPHIA Natural Health Center is the largest natural health and wellness clinic in Connecticut, combining the traditional healing arts of Chinese and Naturopathic Medicine with modern science– getting our patients results when nothing else has worked.